"I want to thank Coach Prohm for a tremendous four years and wish him the best at Iowa State," Ward said. "I have no doubt he'll be successful with the Cyclones. 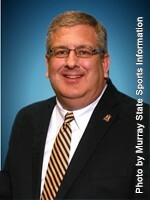 He's a class individual and represented Murray State proudly. I will always be grateful for his service. Because of the unusual timing of this move, it's in our best interest to move very quickly to find a replacement. I'll be visiting with Murray State President Dr. Davies this afternoon to determine our course of action. Murray State has been fortunate to have success for many years under the leadership of some of the most talented coaches in all of college basketball, this time around will be no different. It is our goal to find an individual that embodies what Murray State is all about and will embrace the expectations we have for this program. The future is bright for Racer Basketball."